The 26.2 with DONNA is a local marathon, founded by local, former Donna Deegan, herself a three time survivor of breast cancer. Deegan created the DONNA Foundation in 2003, as a nonprofit organization to help breast cancer patients with critical needs. The race draws thousands of runners from all 50 states and 20 countries, all heading to Jacksonville, Florida, for two days of running on the second weekend of February: a 5K and 10K on Saturday, and a half and full marathon on Sunday. 2017 marked the 10th anniversary of the race, and I really wanted to be a part of it. I had done the Saturday 5K a few years ago, but the experience just isn’t quite the same as on marathon day. Additionally, my running buddy was doing her first half and I wanted to be there to support her. February is a rough time for me to train for a half, so when I stumbled upon the DONNA Marathon Relay option, I knew I had my answer. I rallied four other running friends and we put together Team Pretty in Pink: five runners set to cover 26.2 miles. As Team Captain, I was responsible for assigning legs to the runners, collecting and distributing packets, and making sure everyone was good to go. The group was easy-going and awesome and made my job incredibly easy. I got everyone’s things at the expo, passed them out and made our final plans. We were ready for race day. Parking lots for the DONNA opened at 4:30 AM for a 7:30 AM start. I had heard rumors of bad traffic, and I wanted to be ahead of the game. I picked up E and K at 5:30, and we slid into a spot at TPC right after 6:00 AM, without hitting a lick of congestion. There was a bit of a walk to the start line area, and it was a lot cooler than I had planned. The race day temperatures promised to be up in the 80s, so I dressed in a skirt and tank and never even considered other layers. Oops. On the plus side, I am really glad that I added the last minute pink Sparkle Athletic skirt. It was more pink than I’ve ever worn, but I fit right in. On our walk to the portapotties, we met up with K’s friend S and another teammate L. The Runner’s Village was bustling and well stocked – there were plenty of facilities, as well as coffee and Dunkin Donuts available. We waited in line for the bathroom, checked our gear (super easy), and then I went to figure out where the relay shuttles were. Race FAQs recommended that runners be at the shuttle station two hours prior to when they needed to be running, which we all thought was a little overkill, but we didn’t want anyone missing the shuttles, either. I sent E and L off on the shuttle, and realized that I desperately needed the restroom again. I got back on line which was significantly longer this time. I was really scared I was going to miss the start of the race. While waiting, I found K and directed her to the shuttles, as well as giving her my predicted arrival time (she was running Leg 2). Finally, with seconds to spare, I was clear for the start line. Only to find out that K and S stopped for one last potty break and were on their way, too! Due to the sheer quantity of runners, the event had decided on a “pulse start.” This meant that runners would be released in sections, rather than all at once, giving the course some time to open up a bit. It proceeded very smoothly, with music and huge bursts of confetti each time. Our small trio ended up starting at around 7:45. Leg 1 of the relay was six miles. 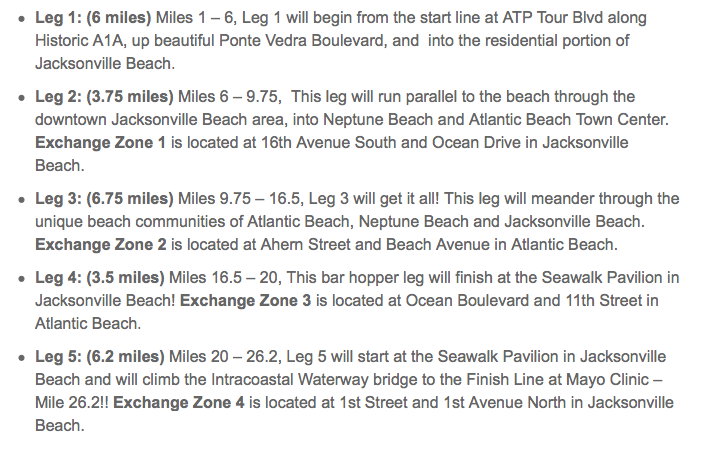 It would cover the distance from the start line, all the way down A1A in Ponte Vedra, and end up with the transition on Ocean Drive. My plan was to run with K and S to mile 7, where they would turn around at the halfway point of the half marathon, and continue with my teammate K for her leg of 3.7 miles (each leg was a different length), thus getting my long run in at the same time. Insert witticism about best-laid plans. The first few miles rolled by easily. The crowd support was absolutely unreal. Everyone was dressed in pink and had decorated in pink and I couldn’t believe how the homeowners in the neighborhoods had all come together to celebrate the runners. It was beautiful. The weather was humid but cool and overcast and things felt good. I even got to cuddle a pair of pugs who were out cheering with their owners. At Mile 4, I felt something in my tummy that no runner ever wants to feel. I took some deep breaths and figured I could just work my way through it until I reached transition. A few blocks later, the cramps were not subsiding and I had to tell K that I loved her and that I was proud of her, but she needed to go and finish the race for which she had trained. I took a short breather on the side of the course, just to collect myself, and then eased back into some slow running. I texted my teammate K to tell her that the wheels had fallen off, and that I was going to try to make a bathroom stop, and she told me not to worry. She would be in place whenever I got there. At mile 5, I realized that no bathroom was in my future. I knew there would be some by the transition area, so I decided to just go for it and hope for the best. That last mile was perhaps the coolest, and I hated that I didn’t even manage to stop for photos, because I was so distracted by the cramps. Of course, the portapotties appeared about 50 feet before my handoff, so I rounded the corner, found K, tossed her the baton and backtracked. Not at all how I wanted it to go down, but it was what it was. I debated trying to catch up with K, but I wasn’t sure how fast she had gone out or how far ahead of me she was. My best option was to get on the shuttle back to the finish line at Mayo Clinic and wait for half-marathon K to come through. I collected my medal and some water, and walked the two blocks to the shuttle stop. Where I proceeded to wait for almost an hour with the other runners in the freezing wind off the ocean. Honestly, my only complaint about the day was this transportation issue. The “shuttle liaison” had no phone numbers, no radio and no clue about contacting anyone to come get us, and finally, a volunteer managed to get in touch with someone who sent a bus right to us. I missed K’s grand finish by about five minutes. Sad face. On the plus side, Mr PugRunner had brought little man to the race finish – he loves Ms. K and wanted to make her a sign to celebrate. He did a fantastic job and I think she was really happy with it. At the finish line, things had warmed up, and I was very grateful to be out of the wind. Mr PugRunner set up a camp chair for us, and we began the wait for Team Pretty in Pink. K took on Leg 2, E had Leg 3, L selected Leg 4, and A was on the final leg. As each runner finished, she made her way to the Runner’s Village. There was plenty of refreshment and entertainment: complimentary beers and a selection of soups (which would have been awesome for the freezing temps the race normally endures, but were hard to eat in the summer weather), and then BBQ, Rita’s Ice and other snacks for sale. I had a cooler with snacks and drinks back in the car at the start line, so I ended up purchasing an ice just to get a little sugar into my system. It helped me feel a lot better. We kept tabs on A, and when she was halfway through her Leg, K, E and I headed backwards on the course to run her in. She had the hardest leg by far – it was long (and she had been waiting a while), the hottest and involved a huge bridge and an overpass. We figured she would need all the support she could get at that point, and we were happy to take her to the finish line. By that point, we were ready to head out. We had to take a 20ish minute shuttle ride back to the parking lot, and then walk to the car. I don’t know how I’ve managed to miss this event for so long. It was simply amazing. I couldn’t get over how involved the community was, and how inspiring it felt to be out there running with so many strong people. It was such a beautiful thing, and I don’t think I can omit it from my race calendar in the future. We actually talked about keeping the team for next year, and how to make it even better, and I’m pretty excited about it, except I also kind of want to do the half marathon, too. So I guess some decisions will have to be made. Aside from the transportation snafu, I did have a tiny complaint about the relay “baton.” Each of our runners had to carry this. The “baton” was HUGE. And unwieldy. And ridiculous. I would much rather have had an anklet that runners could pass off to each other. Or even one bib on a belt that could have been handed off along the way. It certainly wouldn’t make me not run again but it was annoying, and there are definitely better ways of timing relay teams. This was a fabulous day for a truly wonderful cause and I can’t wait to do it all again next year! Have you ever run a marathon relay? What’s your favorite “race for a cause”? Doing a relay race just has a whole different feeling about it doesn’t it?! Looks like a great time for a fabulous cause. It really does. I loved it. These relays always look like so much fun to me but a huge commitment too. Team Pink! Love the pics. I’ve never done a relay before but I think it would be fun! You’re right, that baton is ridiculous! that looks like so much fun!!! love the skirt! I’ve never done a race relay but I would love to try to do it one day. You look so happy in all of your photos – that’s the best way to run a race! I love that there is a relay option for this race. I have looked at doing it before as a breast cancer survivor myself. One of these years, I’m gonna put together a relay and do it. Sounds like a great race! That baton is ridiculous… I ran a marathon relay a few years back. It was SO FUN! We said if we did it again we would definitely have two teams so no one was waiting alone. But other than that, it was a great time! For ours we didn’t have an actual baton or anything to carry. I’m not even sure they timed the relay times? If they did, it was just regular chips in the bibs. When I ran Ragnar we had a slap bracelet, which was pretty awesome. I have run the Vermont Marathon relay twice. Sounds like such a fun race and for a great cause. Such a fabulous race for a fabulous cause. Will you ever participate in the non-relay version of this annual event? You certainly wouldn’t have to carry that large baton if you did. I kind of want to do the half marathon now. Kind of. But if we can get a few teams together, I would be great with the relay again. I would just make sure I ran more than my leg. Definitely no interest in the full, though. I’ve done a half relay. Also some transportation issues, but they actually don’t promise to help you out with it. That all sounds very complicated. And you’re right — that baton is ridiculous! But hey, all for a good cause. This one definitely promotes the shuttles back to the finish, so it would have been nice for it to all work out smoothly, but there were a lot of moving parts, and not everything is going to go according to plan. It didn’t ruin the day, by any means. I was definitely glad to hand off that baton. Oh my gosh, I wish I knew you were there too so I could have said hi that morning. Looks like so much fun! Ive never done a relay but we have one for the Baltimore Marathon that Ive always considered. Seems like it could get kind of complicated though! It’s a different experience from the regular half or full experience. It’s certainly something to try to mix things up. I ran the marathon last year at Donna. I loved the course and the entertainment even though it was a bad race for me. The hardest part was watching the fresh legs of the relay runners blow past me as I was struggling at mile 20. 🙂 I thought the baton looked uncomfortable hold while running. Once again I almost saw you. 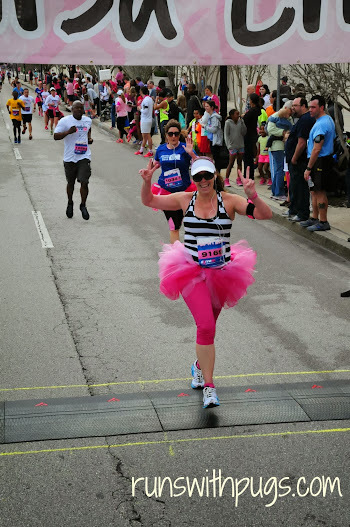 I was cheering at mile 9 and 17 since my husband was running the marathon.